Safari themed, Free WIFI + Long Distance, TVs in Every Bedroom, games room, huge yard! 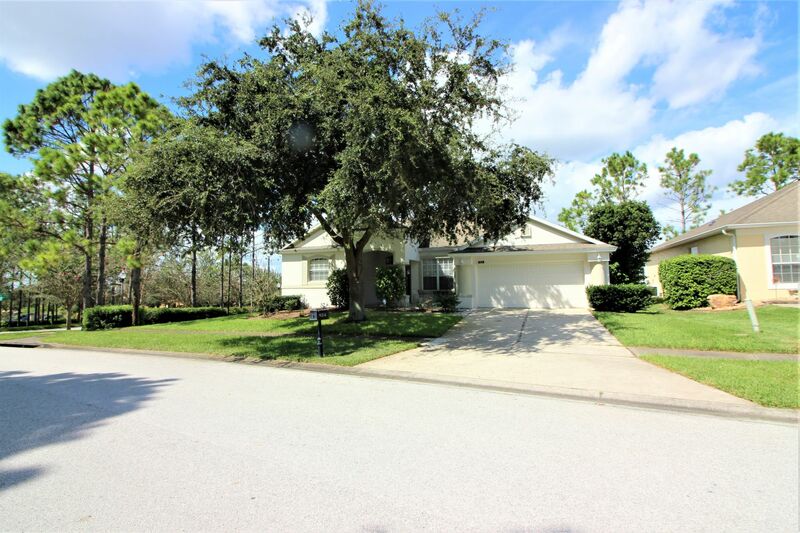 This beautiful, villa is nestled in the popular Highlands Reserve community, less than 9 miles from Disney's doorstep in Kissimmee, Florida and is perfectly placed for the shops, restaurants, fun and attractions that Orlando has to offer. With 4 bedrooms and 3 bathrooms, this fully air-conditioned, all tile floors, family friendly vacation home is perfect for extended families, friends traveling together or for those that just need a little extra room, sleeping up to 10 people (even more if there are babies!). This safari themed home has a bright, spacious family room to relax in during the day or evening, with a sofa, a loveseat, two cozy chairs, extended cable TV, VCR, DVD,stereo and WiFI for your comfort and enjoyment . The family room, breakfast nook and kitchen are all open to each other. There is also a living room and a formal dining room. This home has plenty of space for everyone to spread out and enjoy. There's even more fun and entertainment in the private games room with a pool table and air hockey you won't want to leave! The garage games room also has plenty of outside toys and equiptment for the kids to enjoy the large yard. Step out from the family room under the shaded lanai, have a barbque and eat al-fresco at the the shaded dining table as you enjoy your meal. Step on to the huge sun-baked screen enclosed pool deck, and dip in to the cooling and sparkling waters of your own private pool ( with optional pool heating)! When you need more of that beautiful Florida shunshine, head out to your huge deck and soak up the sun while the kids play in the massive yard! When you are done in the pool, additional doors off the deck lead directly to the master ensuites. For extra added protection for young children the pool is completely enclosed by a safety fence. 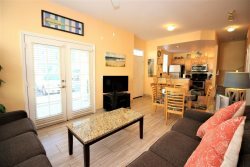 The kitchen has been equipped with everything that you could need to provide a family feast to enjoy together either at the dining area off the front entry hall, at the breakfast nook, at the kitchen counter bar or out by the pool. Luxurious sleeping accommodation awaits you with 1 King Bed, 1 Double/full Beds, and 4 single beds. There is also a queen sized sleeper sofa in the master bedroom sitting room. The master suite takes up one side of the house. It has a king size bed, a TV and a sitting room (with sofabed) with patio doors that lead directly out to the pool. The lighted filled ensuite has a jetted spa tub, a separate shower and double sinks. The second "mini master" suite is on the other side of the house. It has a unique bamboo canopy style full bed, a TV and VCR and its own bath. The full bath has a tub/shower combination and a door out to the pool. There are two more fun, safari rooms, each with two twin beds and a TV. These two rooms are separated by a hall bath with a full tub/shower combination. All Tile Floors, no carpet! Angela is amazing very helpful and quick to fix anything you may have an issue with. I loved this property . It was on a corner so no one on one side of you, the pool area was amazing . Plenty of area for our family and extended to hang out and be comfortable. We had a birthday party there and had 10 people all together , we coulda had 10 more. The master suite is the best part, very private . Loved this house, this was Angela's pick for us and it was the perfect fit for us. Thank you. We stayed last August completely forgot to fill this out. See you soon.